With less than a month to go until Christmas, the Sarsen team are looking forward to a few festive frolics, starting with the Save the Children Christmas Jumper event. We will be tweeting pictures of everyone wearing their Christmas jumpers with the hashtag #xmasjumperday. You can follow us on Twitter here. If you would like to sponsor our efforts (and they will be significant, we promise!) and help us raise money for a worthy cause please contact Laura – laurab@sarsen.net. The S5PE-F (S5-PCIe-F) is BittWare’s most versatile Stratix V board to date, with full FMC site support and flexible SODIMM sites for memory expansion. The Vita 57 FMC site provides high-performance SerDes and LVDS, along with clocks, I2C, and JTAG all connected directly to the Stratix V, enabling designers to customise the S5PE-F to their individual needs with a variety of I/O or processor FMCs. The VPX (VITA 46) standard was developed in support of ruggedised, deployed systems. Extreme Engineering (X-ES) has a range of VPX COTS power modules which are designed to meet the rigours of high-performance military applications. The latest power module from X-ES is the XPm2220, which reduces the total SWaP, cost and complexity of VPX-based systems by providing a number of distinctive capabilities, including industry-leading output power and efficiency. It also provides direct support for a wide input voltage range, and fits within a single 0.8in or 1in pitch 3U VPX slot. The TMS4703 and TMS4705 are the latest additions to Trenton’s series of military computers designed for MIL-STD-810G and MIL-STD-461F operating environments. The rear panel design of the systems supports a flexible, customer-driven arrangement of sealed MIL-DTL-38999 and MIL-STD-1553 connectors. The TMS4703 supports a PICMG 1.3 SBC/Backplane architecture while the TMS4705 supports embedded motherboard options. Both systems deliver the system performance, configuration stability and longevity needed to support long project life cycles and extended military computing field deployments. 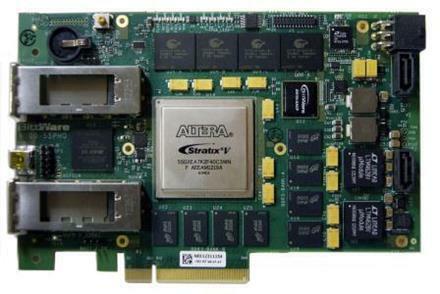 Altera’s SDK for OpenCL is now supported for a wide range of Stratix V devices on BittWare’s S5PH-Q (S5-PCIe-HQ) COTS PCIe board. FPGA options now include GSMD5, GSED8, GXEA7 and GXEAB devices. The S5PH-Q is a half-length PCIe x8 card providing up to 16GB of on-board DDR3 memory at 800MHz (1600 Mtps). Two front-panel QSFP+ cages allow implementation of two 40GigE (or eight 10GigE) interfaces direct to the FPGA for reduced latency.